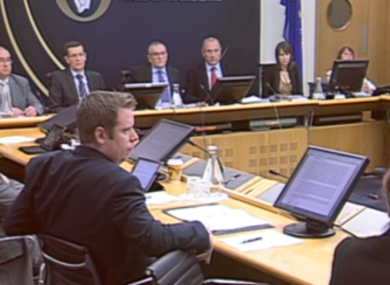 THE PUBLIC ACCOUNTS Committee (PAC) has questioned why it has received unsolicited legal advice that it cannot question Irish Water boss John Tierney. TDs on the committee have been told they do not have the power to investigate Irish Water’s start-up costs or Tierney’s involvement in the controversial Poolbeg incinerator project when he was Dublin city manager. The advice came in a letter received last night from the parliamentary legal advisor Ramona Quinn who said that PAC cannot scrutinise Irish Water or Poolbeg because neither are subject to examination by the Comptroller and Auditor General. At this morning’s meeting of the PAC, questions were raised as to why the legal advice had been given with independent TD Shane Ross pointing out it had not been sought. “Why are we legal opinions which we haven’t sought,” Ross asked, saying that there is “a pattern developing that is deliberately trying to muzzle us”. Committee chairman John McGuinness said he could not explain how the letter containing the legal advice arose and described the situation as “ridiculous and a waste of time”. “I believe firmly that Irish Water should come before us… I believe that someone should answer interrelation to Poolbeg,” he said. The Fianna Fáil TD said that he “took exception” to the fact that public commentary by he and other members of the committee about Irish Water and Poolbeg had resulted in “legal advice dropping out of the sky last night”. Fine Gael TD John Deasy described the situation as “absurd” and accused parliamentary legal advisors of trying to “constrain everything that this committee does”. Sinn Féin’s Mary Lou McDonald said “there has been an attempt to trim the sails of this committee”. McGuinness said he would discuss the letter with PAC clerk Ted McEnery and find out who was responsible for it. “I intend to defend the right of this committee to its independence,” he added. Email “These politicians want to know why they got legal advice they didn't ask for ”. Feedback on “These politicians want to know why they got legal advice they didn't ask for ”.